A short time with the 2.4 Hilux means I’ll think hard when time comes to renew. 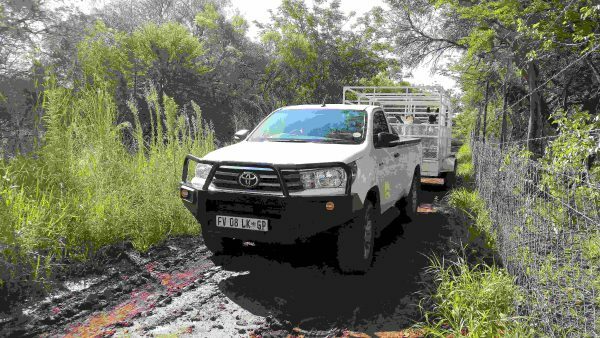 We seldom get the chance to put single-cab bakkies through their paces, so when I was offered a Toyota 2.4GD6 workhorse, I jumped at the chance. I own a small farm, for now anyway, and there is plenty of work for it out there. My wife has wanted donkeys for ages, and as it happened, a friend offered us four – for free. The only requirement was that we fetch them from her farm about 50km away. One should never look a gift-donkey in the mouth, so we hitched up the trailer and set off to claim our windfall. The trailer in question is not your average ventertjie used to carry camping equipment or garden refuse. It is a twin axle cattle trailer weighing approximately one ton empty. It is braked and therefore allowed to carry a payload of 2.5 tons, if I recall. I am told a donkey weighs about 400kg, but fortunately they were not all adults and I figured we were within the 2 750kg legal towing capacity of the raised body 4×4. The trailer had to be manoeuvred fairly precisely onto the loading ramp and this was made considerably easier by generous rear view mirrors. The donkeys were less accommodating and their reputation for stubbornness is well deserved. After more than an hour long wrestling match the comfortable bucket seats were more than welcome. 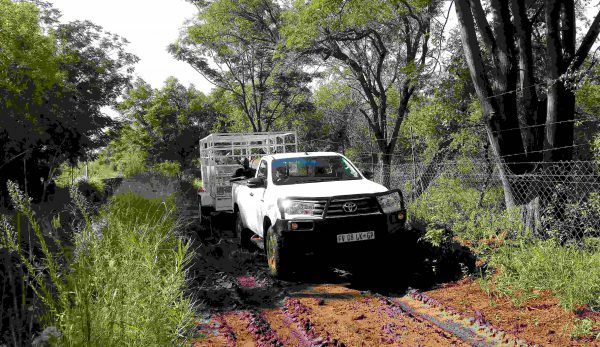 The Hilux pulled the load extremely easily, although to engage sixth gear it wanted to be doing at least 100km/h. I, however, did not and mostly cruised along in fifth. Obviously this nudged fuel consumption up a little, hovering around the 12l/100km mark as opposed to just over 8l/100km. Load positioning and load shift on a trailer are critical. I had made this mistake with this trailer before, carrying a pallet load of tiles. The result was that the combination became uncontrollable at anything above 40km/h. 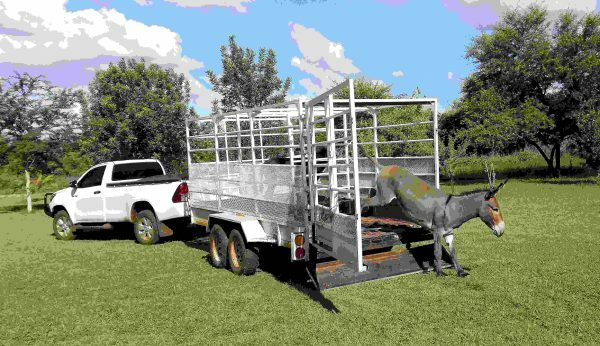 This trailer allows stock to be corralled in two compartments, front and back, so that animals are not hurt when the trailer is not fully loaded. 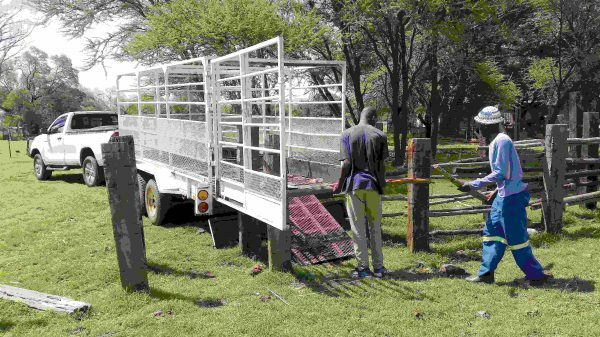 We confined the donkeys in the front for their safety and to ensure downward pressure on the tow hitch, an important aspect in preventing fishtailing. The trip home was mainly good dirt road and, using 4×4 high, it was effortless. The Hilux handled and felt pretty much as it had empty, with the obvious exception of gear selection. This proved to be so much the case that upon checking my rear view mirror about half way home, I noticed my new pets had managed to open the dividing gate. This means they were roaming freely around an area longer than the Hilux itself. That is significant load shift and I had not even noticed it. I was impressed. The last couple of hundred metres to the animals’ new home is a poor dirt road running alongside a leaky irrigation canal. When it rains, as it had the previous night, it makes a special kind of mud that is so slippery it has seen a few vehicles having to be dragged out of the canal itself. It was not without some trepidation I lined up the rig and selected 4WD low range. This was after all the biggest load I had ever hauled through the obstacle. The Hilux dragged it through without my heart even skipping a beat. Single cabs have a distinct advantage over double cabs – over and above the bigger load bay. The load itself can be placed far further forward, preferably with the weight bias ahead of the rear wheels. So, although the load mass capacities may be similar, the single cab allows them to be carried more safely by reducing the effect of understeer caused by the load being too far back. I have never owned a single cab. A short time with the 2.4 Hilux means I will think long and hard when the time comes to renew.